Look at the sign on the left. 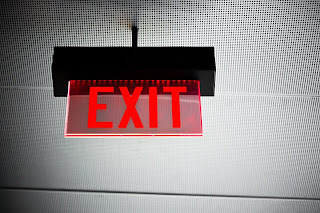 If you’re an American, its meaning is instantly clear: EXIT means GET OUT HERE. It’s obvious, right? 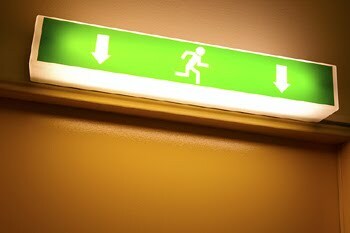 The glowing red color conveys urgency and is easily spotted in any commercial space. But according to Julia Turner, in a fascinating article in Slate, people from other countries are confounded by our familiar icon, and much prefer the green running man on the right. If you think about it, the graphic design on the right makes a lot more sense. The running man, which was designed by about 40 years ago Yukio Ota, can be understood even by people who can’t read English, including those who interpret the color red as signifying DANGER or STOP (not “go this way to be safe”). But change is inevitable — and good graphic design inevitably triumphs, especial in a word class city like New York, which altered the fire code four years ago to mandate that high-rises include the running man on fire doors on every floor. At Makovsky + Company — one of the nation’s leading independent global public relations and investor relations consultancies — we believe that specialization is the best way to build reputation, sales and fair valuation for our clients: companies in the financial and professional services, health, technology and business services sectors. Our tagline, the Power of Specialized Thinking™ underscores the deep knowledge and relevant relationships we bring to client engagements, our hallmark since we were founded in 1979. We have created this blog to share our insights, opinions and commentary with corporate communications leaders around the world. Garlic: Effective against Vampires … and Cancer?